Southend Plumber - Plumber based in Leigh-on-Sea, Essex. My name is Mike and I trade as Southend Plumber. I consider myself to be running a passionate, considerate company that always aim to please. Customer feedback is one of my main priorities and I will always do everything possible to ensure the highest of standards. 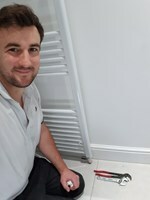 I have been trading as Southend Plumber for 3 years which has originated from a family run Plumbing & Heating business that has been around for over 40 years. I specialise in emergency plumbing and I am ready to respond to an emergency with no hesitation, fast response in order to reduce damage caused by water leaks to the domestic water, heating systems or any kind of blockage that may occur within or around the household. Whether it's an emergency or just that you fancy something new - Southend Plumber is the guy for you. Southend on Sea, Leigh-on-Sea, Hadleigh, Benfleet, Chalkwell, Westcliff, Southchurch and all other surrounding areas.